Sediment Composition: Compared with other Oregon estuaries, Coos estuary sediments contain a high percentage of “fines” (i.e., clay and silt), which tend to be concentrated in the upper estuary near tributary mouths (e.g., Coos River, Isthmus Slough, Haynes Inlet). Sediment Contamination: Sediment quality in the upper estuary may be contaminated with metals, synthetic organic compounds, and other industrial chemicals. There are several instances of confirmed releases of these chemicals, which have primarily occurred in Isthmus Slough and the Upper Bay subsystems. This section includes the following data summaries: Sediment Composition, and Sediment Contamination— which describe the condition of Coos estuary sediment in the lower Coos watershed. Sediment Composition: Data summarizing sediment composition in the Coos system came primarily from two sources. The Oregon Department of Environmental Quality (ODEQ) monitored sediment composition in the Coos estuary from 1999 to 2006 as part of their Coastal Environmental Monitoring and Assessment Program (CEMAP)(ODEQ 1999, 2001, 2004, 2006). The United States Army Corps of Engineers (USACE) also assessed sediment composition in a series of sediment quality evaluation reports (USACE 1980, 1989, 1994, 1998, 2004, 2009). These data sources are supplemented by two additional reports: 1) Lee II and Brown (2009) provide a regional perspective by characterizing sediment composition of seven Oregon estuaries; and 2) Hubler (2008) describes the macroinvertrate response to fine sediment stress in the Coos River subsystem. In addition to these studies, the Coastal and Marine Ecological Classification Standard (CMECS), a NOAA-developed habitat classification scheme currently being applied to Oregon’s estuaries by the Oregon Department of Land Conservation and Development, was used to generate maps of generalized areas with fine sediments (CMECS 2014). It’s important to note that CMECS is currently in the developmental stages; its data layers are subject to refinement. 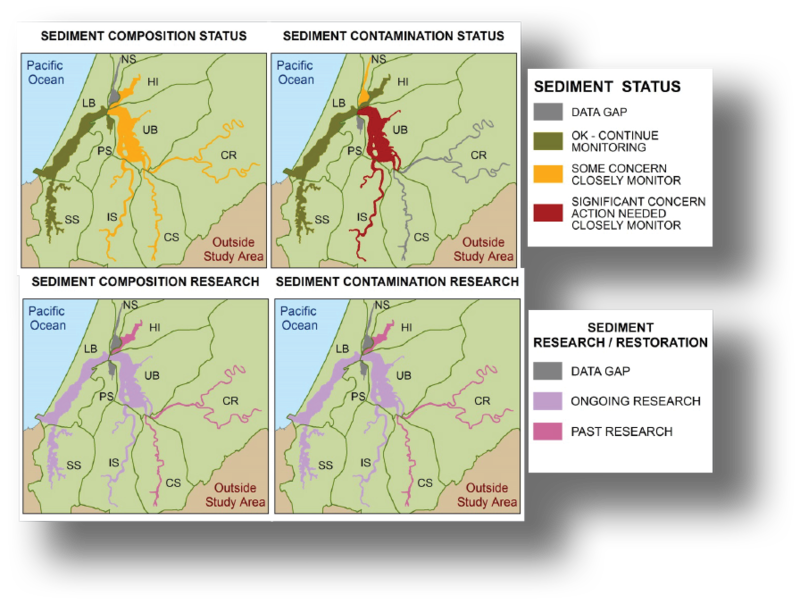 Sediment Contamination: Similar to sediment composition, sediment contamination data came primarily from the CEMAP program as well as the USACE sediment quality evaluation reports (ODEQ 1999, 2001, 2004, 2006; USACE 1980, 1989, 1994, 1998, 2004, 2009). Sediment contamination is assessed using a set of sediment quality guidelines (SQGs) that were established by Long et al. (1995). These data quantify a suite of metals, synthetic organic pollutants, industrial chemicals, and total organic carbon (TOC) in Coos sediments. These data were also supplemented by additional studies. From 1986 to 2006, NOAA’s Mussel Watch Contaminant Monitoring Program monitored sediment contamination at two Coos estuary sites every ten years (NOAA 1986, 1996, 2006). In 2007 and 2009, TOC was measured by ODEQ in the Isthmus Slough and Coos River Subsystems as part of a dissolved oxygen study (ODEQ 2007, 2009). Where possible, regional data (i.e., Washington, Oregon, and California) are presented to provide context for interpretation (Hayslip et al. 2006, Nelson et al. 2007). A review of the potential and confirmed toxic release sites within the study area is also provided. This information came from several ODEQ and USEPA sources, including the Toxics Release Inventory (TRI), Brownfield listings, the Environmental and Cleanup Site Information Program (ECSI), and the Confirmed Release List (CRL)(ODEQ n.d., USEPA 2014). In addition to sediment contamination, this chapter summarizes data useful as indicators of sediment quality, such as fish tissue contamination data from the CEMAP program (ODEQ 1999, 2001, 2004, 2006). Dissolved contaminants are also briefly discussed here but refer to the Chapter 8: Water Quality for a more complete discussion. Collectively, the CEMAP program and the USACE sediment quality reports represent observations in all nine subsystems (see maps above)(ODEQ 1999, 2001, 2004, 2006; USACE 1980, 1989, 1994, 1998, 2004, 2009). The majority of these data come from the Lower Bay and Upper Bay Subsystems. In some subsystems, the data may be sparse. For example, the only metals sampling in the North Slough subsystem occurred in 2002 (ODEQ 2002). As a result, there are only three observations for metals in this subsystem. The accuracy of a data set is a function of its size or “robustness,” because larger samples more accurately estimate the population mean. For this reason, the number of observations in each subsystem is provided when contaminant data are presented. In many cases, the data may be outdated. The most recent data for both sediment contamination and composition come from 2009 (USACE 2009). An all-inclusive evaluation of sediment quality is made difficult by the limitations of the SQGs. Although Long et al. (1995) developed SQGs for nine metals and 19 synthetic organic pollutants, none have been established for some commonly occurring contaminants (e.g., petroleum hydrocarbons such as diesel and hydraulic fluid). The guidelines for evaluating fish tissue contaminants are also subject to some limitations. Developing human health standards for safe fish consumption requires making numerous assumptions about dietary preferences, characteristics of the consumer (e.g., body weight and age), level of risk aversion, and other variables (USEPA 2000). To avoid making overly broad generalizations, the contaminants data summary refers curious readers to the appropriate online tools (USEPA 2007a; OR Health Division, n.d). Interpretation of sediment quality data is further complicated by the intricacies of environmental systems. The mobility and availability of contaminants in estuaries is influenced by many factors, including chemical, geological and physical processes such as oxidation, precipitation, sedimentation, tidal inundation, etc. (Carroll et al. 2002, Bauer and Bianchi 2011, Williams et al. 1994). In addition to natural processes, pollutant cycling is carried out against a backdrop of human land use activities, which can further complicate an already intricate process (Bauer and Bianchi 2011). The sediment contaminants data summary applies Long et al. (1995) methods to analyze sediment quality in the study area to provide consistency for evaluating sediment contamination within and among estuaries. However, the approach does not account for the interaction of multiple chemicals or environmental conditions that may affect the toxicity of contaminants (USEPA 2002). It should be noted that the environmental impacts of sediment contaminants is subject to change as the surrounding conditions in the estuary evolve. In many cases, the toxicity of sediment contaminants in aquatic organisms is dependent on species-specific physiology. Toxic responses in plants and animals require the transfer of chemicals from the environment to biochemical receptors on or in an organism (USEPA 2007b). Therefore, the ecological response to changes in sediment contamination may vary depending on individual species tolerances for a given contaminant. 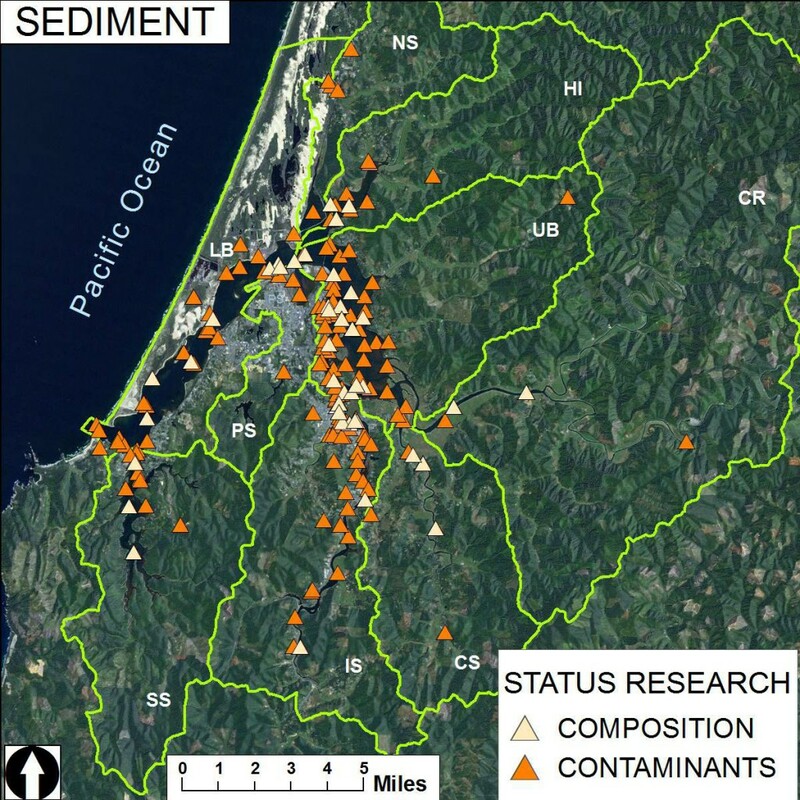 Due to the complexity of these systems, the status of sediment contaminants in the study area should be interpreted along with the data presented in the contaminants data summary of “Chapter 8: Water Quality in the Coos Estuary and the Lower Coos Watershed”. Interpreting both together offers a more comprehensive understanding of the overall status of contamination in the Coos estuary. Carroll, Susan, Peggy A. O’Day, Brad Esser, and Simon Randal. 2002. Speciation and Fate of Trace Metals in Estuarine Sediments under Reduced and Oxidized Conditions, Seaplane Lagoon, Alameda Naval Air Station (USA). Geochemical Translations (3): 81. National Oceanic and Atmospheric Administration (NOAA). 2006. [National Center for Coastal Monitoring and Assessment, Mussel Watch Contamination Monitoring Program]. Raw data. Accessed from the Estuarine and Coastal Sciences Laboratory of South Slough National Estuarine Research Reserve on 7 August, 2014. Williams, T.P., J.M. Bubbs, and J.N. Lester. 1994. Metal Accumulation within Salt Marsh Environments: A Review. Marine Pollution Bulletin. 28(5): 277-290.